Why did I decide to help students find the books they would use as seeds, or starters, for their research reports? Why did the right starter book matter so much? Here’s why: with rare exceptions, each student would read the whole of the starter book for her chosen-and-received topic. In fact, most students read the whole book through twice, taking thorough notes in the style the student chose, from those I demonstrated. All that happened before a student went on to use other print or video or online sources more selectively. The Common Core Standards now recommend much more reading of non-fiction books for younger students, and I’m hoping that they intend this same thing, as often as possible: not browsing, but actual reading, beginning to end. A good non-fiction book has its own shape and strategy, its own way to model the truth of the world. Sampling little bits won’t give you that. I would rather have a student read the whole of a book written and designed for a child or young adult audience, even if it’s pitched a little below the student’s reading level, than see that same student read little bits of a book written for adults. Instead of just harvesting specific details here and there, my students (average age, 11) could observe and absorb the way the author / illustrator / editor / publisher of the starter book framed the fundamental concepts and ideas. They could connect with their topics not as collections of facts but as ideas supported by facts. From what the Iceman was carrying when he died, we can learn a lot about the skills of his people. Or: Snakes don’t need legs, because different species have evolved very effective ways of moving for their different environments. It’s an ambitious goal, to perceive a topic in terms of its big ideas. Still, I found that students could do this, given carefully selected books. I found that whole classes of very diverse students could do this, every single one of them, given the right range of books to start from, and enough support. 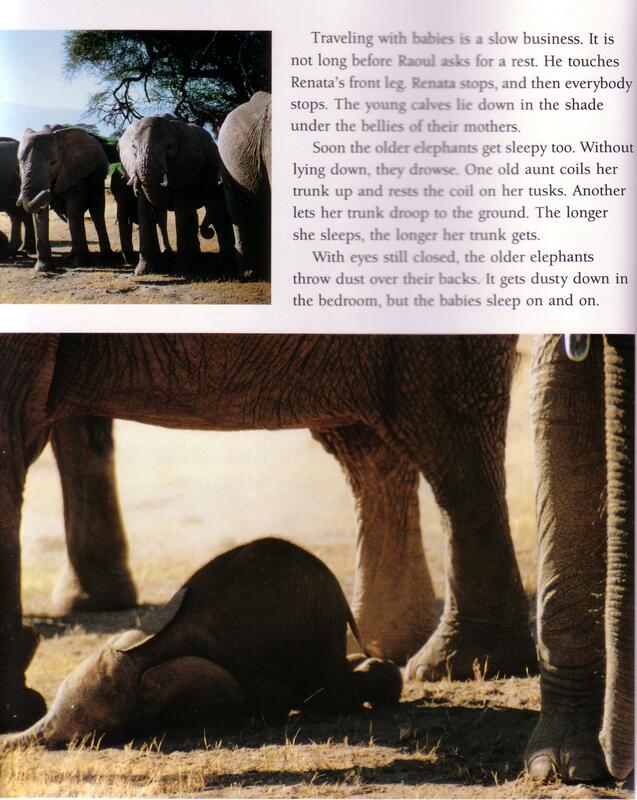 The page above is from Elephants Calling, by Katharine Payne (Crown, 1993.) Following a particular elephant family, this book worked well for students who especially liked non-fiction with a story. In effect, I enlisted all those authors (and illustrators and editors and publishers) as co-teachers–for free, or almost free–and I got to learn from them, too. After years of beginning a research report writing process using a skimathon, what would I give as advice, to a teacher reading this and wanting to try it? Maybe, instead, you’re a home-schooling parent, or a home-schooled student setting up your own process–or even an adult with a new interest, figuring out how to learn all about it. Aspects of this process could work in any of these situations, but I’m going to address teachers, because I’m so glad to have been one–and I know that the job is gigantic. One way or another, you want to give yourself extra time to work with the book collection in the light of what you know about the particular class. I’ll admit that I did a lot of summer work to get started with each of my various skimathon lists–but it was some of my favorite work, apart from actually being with kids. We didn’t teach from textbooks and teacher manuals, so preparing a new skimathon book collection played an important role in helping me get ready to explore a body of material with students. Teaching a multi-aged class in which I almost always worked with some kids a second year, I almost never used the same theme two years in a row. Whenever I came back to the theme, though, our January start for this process gave me time, during the holiday break, to reassess. You’ll probably want to do the same thing. Every time you return to a given theme, you’ll want to search for better books on any topic for which the book at hand has seemed inadequate or out-of-date. You’ll want to find books that appeal to students’ evolving interests, and books that work with your own evolving sense of the theme–which will change, of course, every time you teach it. Beyond what I could get from the libraries, I used part of my supply budget every year to buy new or used books to support the Skimathon and the report writing process. Even if a book was available from a public library, it often made sense to buy a used copy for our classroom library, so a student could keep it over a span of several months. For one version of this process, for a theme asking who we are, as humans, about half the students would eventually write reports about archaeological investigations, such as Pompeii or Skara Brae or Stonehenge. The other half wrote about the history of technology, defined very broadly to include things like early human use of fire, or the history of money. The book to the left, from Scholastic, challenged many of the readers most attracted to it, but it repaid their attention fully, and helped produce some really thought-provoking reports. Through the time when I was teaching, children’s publishers were producing a fabulous explosion of new books on these topics. New didn’t always mean better–but sometimes I could see vast improvement. For example, when I started teaching about animal behavior, very few books emphasized behavior as opposed to physiology (the way the animal’s body works), and even fewer viewed all of this from an evolutionary perspective. I found it exhilarating to watch that change, and harness it in the form of better books for my gang. At the same time, online sources for used books made it easier to find older books that were still the best of their kind. Like all the books I’m featuring this time, this one (Chelsea, 1995) is officially out-of-print, but can still be found–and it’s an extraordinary book, truly focused on ideas supported by details. 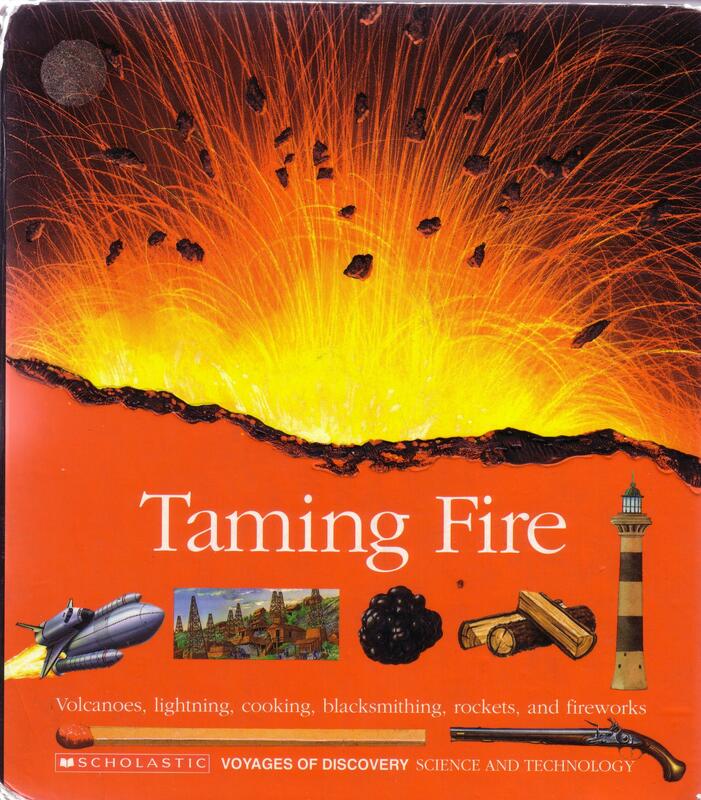 We used it not as a starter book but as a secondary resource for a number of topics: fire, shelter, agriculture, time-keeping. One way or another, every time I worked with these topics, I could find better books for the skimathon. 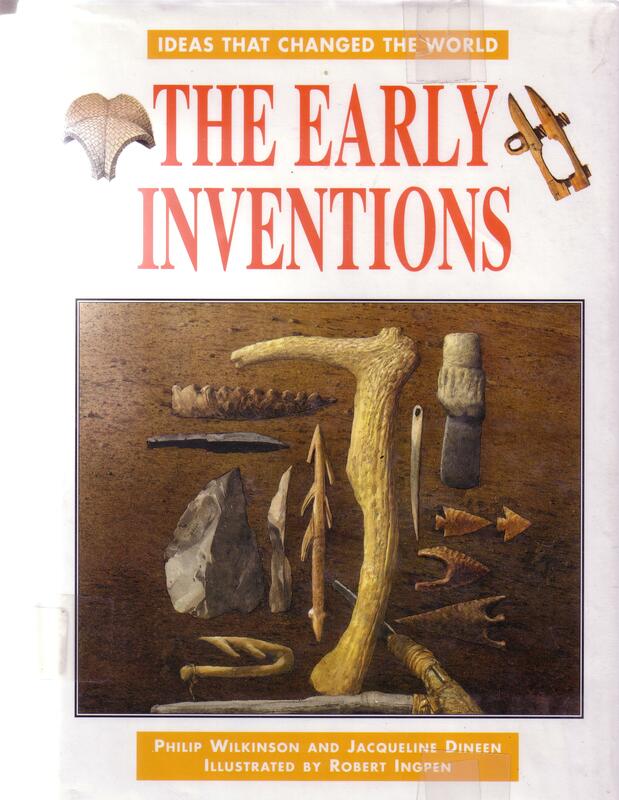 In addition, if I knew about special interests of particular kids, I stood a good chance of finding the right starter book: a book about the history of musical instruments, for example, or about the Phoenicians. Surprisingly often, the child I’d targeted for a particular book would fall in love with something else, and the book would go to another student who had never before heard of the Chinese buried warriors, say, but became instantly spellbound. Overall, the kids’ collective interests, intersecting with our topics, constantly lured me in new directions, enriching the whole enterprise. Whenever you can, choose books that will support hands-on work. For another version of this process, within a thematic study asking what we can learn from animal behavior, students would observe live animals at zoos and aquariums, connecting both formal and informal observations with what they had read in their books. So I tried to find books that would really support that process of connection-making, books with detailed descriptions and illustrations of behaviors kids would be likely to see when they went watching, behaviors such as locomotion, use of senses, feeding, territorial behavior, or dominance behavior. I also spent time calling our region’s zoos and aquariums to make sure they still had the animals in question, and removed the books for animals kids wouldn’t be able to find anywhere nearby. With a heavy heart I set aside an excellent book about the colony behaviors of naked mole rats, when the zoo in Providence closed their naked mole rat exhibit. In these same phone calls, I’d ask the curator, “What animal species do you think are especially rewarding for kids to watch?” Then I’d scour the book sources for books that could work for my students. In any situation in which you’re counting on a combination of print research and direct experience, you want to check both halves of the deal before you offer it on a list. Students could use the beautiful, information-rich illustrations in the book below, Homemade Houses: Traditional Homes from Many Lands, by John Nicholson (Allen & Unwin, 1993), to help them build models of many types of indigenous architecture. Looking at the book collection as a whole, make sure that you have a good range of reading levels and type sizes, and a good variety of styles of nonfiction presentation. Depending on the age level of your students, you may want some of the starter books to be nonfiction picture books, with much more illustration than text, and limited text volume on each page. All the books should have plenty of illustrations. Every student, no matter what her skills or interests might be, needs plenty of room for choice–especially since you’ll be asking all the students to make multiple choices. 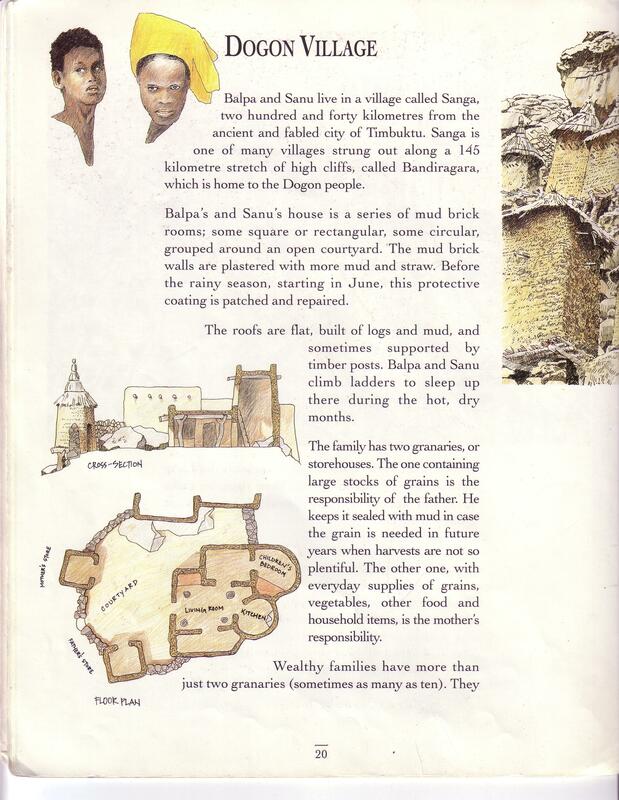 In my groups, I knew that some students could handle the Dorling Kindersley Eyewitness books, or the Usborne books, which have excellent information, well-organized conceptually, but very dense text and illustration layouts on every page. Still, I tried to save those for back-up resources, not starter books. Once you’ve worked with the kids’ choices to assign the topics–I could write a whole post just about that, of course–have the kids help you decide which topic you’ll use, from the ones that wind up not being assigned to any student. Collectively, your students will know all the books, at that point, and they’ll get a huge kick out of suggesting topics for you. If you have an aide, he or she should get a topic too. It could change your lives, after all. I’ve never thought of elephants the same way, after reading about them, watching them at the Roger Williams Zoo in Providence, and taking detailed notes on one elephant’s every move for half an hour. I still follow the work of Katharine Payne’s Elephant Listening Project. 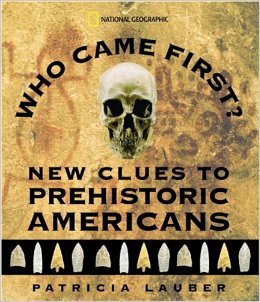 I also seem to be permanently hooked on the earliest settlement of the Americas, a topic full of controversy and even invective between the various experts–with a great book for kids that gives them a sample of competing sources of evidence. Whatever way you might incorporate some of these ideas, good luck! If you’d like some cheering on, get in touch with me by leaving a comment. This entry was posted in Class life, Reading and writing, Technology and tagged animal behavior, archaeology, details vs. ideas, elephants, history of technology, homemade houses, ideas and facts, John Nicholson, Katharine Payne, Lucy Loveridge, Mary Brochu, Patricia Lauber, reading for big ideas, reading nonfiction, research reports, skimathon, taming fire, using trade books in the classroom by pollybrown2013. Bookmark the permalink.